A decade ago, Duke Energy DUK +0.24% didn’t own any renewable energy assets. Today it owns or contracts for 3,000 megawatts — a number that it expects to increase to 8,000 megawatts by 2020. Its purchase of a majority stake in REC Solar is a primary vehicle to getting there and one that will focus on selling solar energy to small-to-mid-sized commercial customers. Companies can own the projects outright and REC Solar will develop them, which it has already done for CVS Health CVS -0.16% Corp. in Hawaii, CostCo Wholesale Corp. and Ikea. If businesses don’t have the upfront capital, they can lease the assets and buy the output in the form of a 20-year power purchase agreement. REC will then own and operate the project. Duke purchased a majority stake in REC Solar in 2015. Altogether, it expects to invest $3 billion in new wind and solar farms in the next five years, up from the $4 billion it spent on renewables over the prior 10 years. 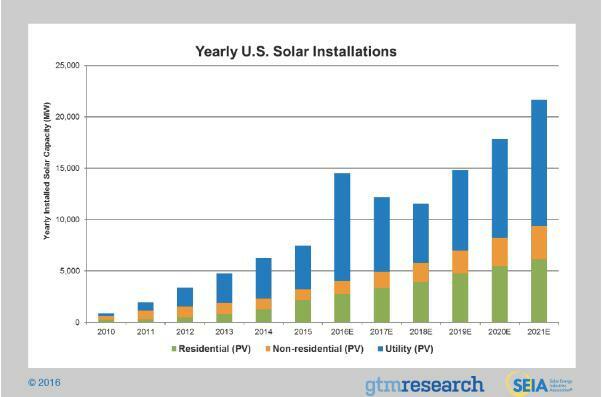 Just how big is the solar market in the United States? GTM Research says that more than half of all utility-scale solar plants in 2016 will be built irrespective of state mandates. Utility-scale refers to those centrally-located projects that aggregate thousands of solar panels and that must ultimately connect to the transmission grid, with the power most often being sold to other utilities. According to the firm, the U.S. will install more than 6,000 megawatts of non-renewable portfolio standard utility-scale solar in 2016. That’s compared to the roughly 4,000 megawatts installed in 2015. 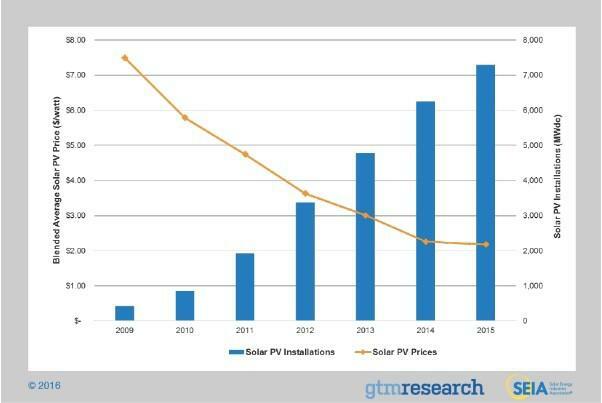 Still, the growth potential for onsite rooftop solar for homes and businesses is also enormous, largely because of the falling price of solar panels. GTM Research says that utilities are procuring green power because it has value. That is, it is fairly priced and it is displacing fossil-fueled energy at the most expensive time of the day, which helps offset carbon emissions. At the same time, power companies are able to lock-in prices over several years, which is also giving the project developers a guaranteed income so that they can build. What other utilities are being proactive? Southern SO +0.54% Co. plans to invest about $5 billion in renewable energy over the next two years. And Berkshire Hathaway&#039;s BRK.B +% energy unit has invested $16 billion in renewablesand now owns 7 percent of the country’s wind generation and 6 percent of its solar generation. And NextEra Energy develops these projects for other utilities. Edison International, meanwhile, is well positioned to compete. It says that the billions it is spending on upgrades goes predominately to its networks — that it only owns about 15 percent of the generation that its customers consume. The other 85 percent is purchased on the open market. ReD Associates’s research says that companies are in dire need of experts to guide them. They are concerned about managing energy costs and commodity prices, as demonstrated by a finding that 25 percent of those surveyed do not have an accurate overview of their total energy spend. That’s why Edison bought in 2013 SoCore Energy that is in the commercial PV development business. It also purchased ENERActive Solutions, an energy efficiency company that works with major companies with worldwide operations. And, it acquired Delta Energy Services, which does data analytics, and Altenex, which helps companies buy renewables at the wholesale level. Indeed, as corporate energy consumers continue their quest for cheaper and cleaner fuel forms, utilities are pushed to meet that challenge — or have other alternative providers step up and potentially replace them. Power companies must thus secure their respective niches in an evolving but greener world.